Westmead Hospital nursing unit manager Nancy Yang has some Lunar New Year tips for you. 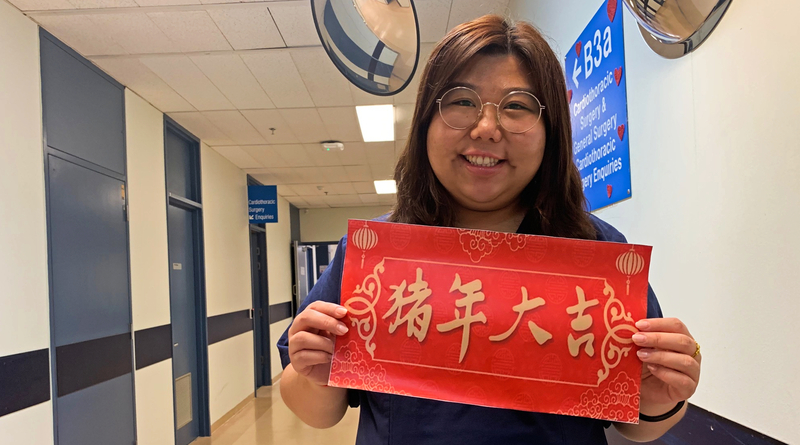 Nancy Yang from Westmead Hospital’s neurology, gastro and mixed medicine ward has shared some lucky tips and tricks that can help ensure the start of the Lunar New Year brings success, wealth and prosperity. Nancy, who is of Chinese descent, said today’s festivities are about togetherness and cuisine, but it is also an opportunity to follow some traditions that can help attract good fortune. “We have 12 zodiac animals and this year is the the year of the pig,” Nancy said. “If you are born in the year of the pig (1935, 1947, 1959, 1971, 1983, 1995, 2007, 2019), you are encouraged to wear red all year round to prevent bad things happening. “People born in the year of the pig are being advised to be careful with gambling and money as there may be a huge loss in money. Nancy said Lunar New Year consists of 15 days of celebration with a duty assigned to each day, with each one designed to bring good luck or deter bad luck. “During the Lunar New Year festive period you must have a good temper. You cannot have fights or you could have bad luck,” Nancy said. “You must also ensure you look after your wellbeing with a good and healthy diet. “It is recommended that people do not shower in the morning of the Lunar New Year to protect your luck and wealth. “From day one to four it’s recommended that no floor sweeping takes place or you could sweep your good luck away. “On day three you must clean the house – because if you don’t, the God of Wealth won’t visit you. “On day four, you invite people to eat at your house or visit a temple. “On day five you eat dumplings and on day six you can go back to work or open your business. Nancy said she has been following these traditions since she was young. “I’m 31 and I still follow these duties – especially house cleaning – I want the God of Wealth to visit,” Nancy said. Nancy said a popular Lunar New Year tradition was gifting money in red envelopes. “Today I will be sending people red pockets with money. You can now send them digitally to people’s phones and I have already started receiving pockets myself. Nancy sent best wishes to staff across Western Sydney Local Health District. “Happy Lunar Year to everyone celebrating today, especially those who are working like me,” Nancy said. “It’s a good festival to celebrate with the family to eat and drink. Goodbye Kay – thanks for your efforts!